The following is an extract from 'Artists and Sculptors of Nottingham and Notts 1750-1950 by Henry C. Hall - 1953'. "Stacey Blake was born at Bradford, Yorkshire in 1873 but came to Nottinghamshire as a child around 1890 and lived at Queen’s Walk and in The Park, both near the centre of Nottingham, then at Woodborough, Bulcote and Arnold. He paints chiefly in water colours and in black and white. He started his professional art as a black and white illustrator and worked for a long time along with his friend, Tom Browne R.I., a Nottingham artist. Painting for Stacey Blake became more of a hobby than a profession and he is chiefly known for his charming water colour drawings of old towns and ancient buildings, shipping and scenes on the coast etc., all most delicately handled with fine execution. 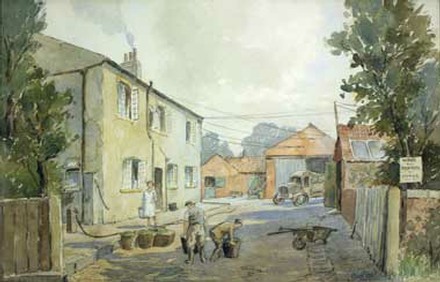 He was a leading member for many years of the Nottingham Society of Artists. He has travelled extensively and has painted in Holland, Spain, France, Belgium, Norway, Morocco, Algiers etc. In addition to works exhibited in Holland, he had them accepted at the Royal Academy, the Walker Art Gallery in Liverpool, Leicester, Northampton, Derby, Nottingham etc. 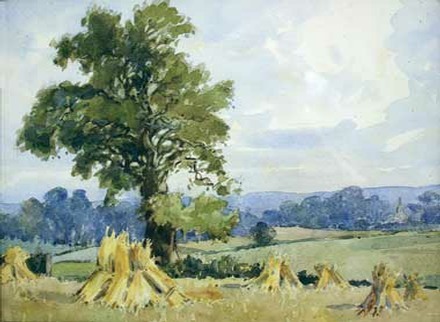 Stacey Blake was appointed vice-president of the Nottingham Society of Artists in 1926. Based on a talk entitled 'Woodborough Worthies' and given by Peter Saunders to the Woodborough Local History. Patricia Kitching (Stacey Blake’s second daughter). Additional research along with the illustrations has also been included. 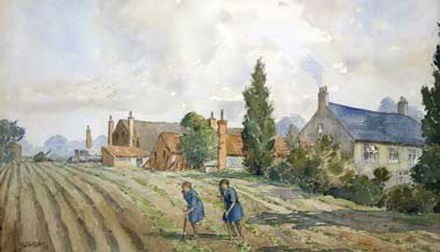 We acknowledge with thanks those who allowed the above watercolours to be copied and shown above. Below left: Derry Mount yard, Moor Lane Arnold c.1930. Below right: Derry Mount near Arnold ‘Market gardening’. Bottom left: View towards Daybrook cemetery near Arnold. Bottom right: Depicting Bank Hill Farm, Woodborough, Nottingham. “As a young man Stacey was a well-known local cyclist, and a member of the Corinthians cycle club. In 1896, at the age of 23, he set off with his friend Tom Browne to cycle the length of Spain. At this time there were no surfaced roads, and the local people were bemused by the sight of bicycles, which they had never seen before. Stacey went on later and alone to cycle from Nottingham to Athens, and he was sponsored for this by Cripps Cycle co. of Nottingham. He went also to Lapland, and again to Spain, crossing to Algiers that time. He was married for the first time in 1902 to Clara Hill. Clara was the daughter of Mary Jane and the Rev’d George Hill the Baptist minister of Derby Road Baptist Church and the family lived at Clare Valley Lodge, the Park, Nottingham. They moved to Woodborough sometime after this. [possibly 1903]. Stacey and Mrs Blake had a dog, a Great Dane called Heather that pulled a wickerwork dog cart. The only record of the Blakes living at the Old Manor is an entry in a Kelly's Trade Directory of 1912. 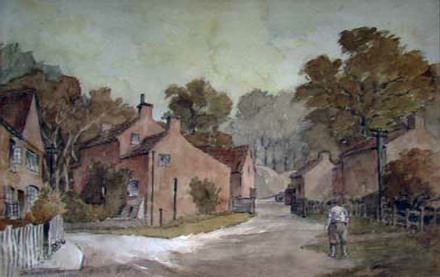 The Blakes followed Mrs Henry into the bailiffs' cottage [it is known that Mrs Henry, a widow, was still residing in either the bailiffs' cottage or Old Manor Farm in 1903], Stacey lived there with his wife Clara when about 1914 they moved to Bulcote. They had their first daughter, Daphne, in 1916 whilst at Bulcote Lodge. Clara died in 1930, and in 1932 he married Ursula Pigott, and his second child Patricia was born in 1934. before the Blakes left the village, Mr Baggaley, a farmer from Long Bennington, walked all his stock and farming equipment the eighteen miles from Long Bennington to Woodborough, crossing the River Trent by the old toll bridge at Gunthorpe in 1912. The Baggaley family lived for a time in the bailiffs’ cottage until the Blakes vacated the Old Manor. 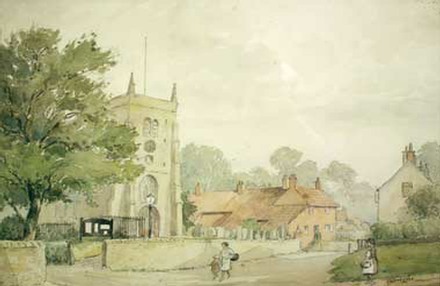 A family of Belgian refugees, the Van der Brock family, came to Woodborough at the beginning of the 1914-18 war and lived in Church Walk. The father was known as Old Jeff and they had three children, William, Charlie and Emily. The father and Emily worked for the Blakes and the daughter Emily slept at the Old Manor.